VERSA-LOK Mosaic is the original solid, pinned segmental retaining wall system capable of building random-pattern tall walls of unlimited height. Mosaic walls feature panels comprising three different VERSA-LOK units in a random four-unit pattern. Each panel is 10 in. in height, 24 in. wide and 12 in. deep and readily accommodates soil reinforcement. Mosaic’s solid construction and top-pinning design ensure easy installation and uncompromising strength. Mosaic is available in two attractive textures: the crisp look of traditional split-face, and Weathered Mosaic, with a centuries-old, hand-hewn appearance that’s perfect for historic renovations. 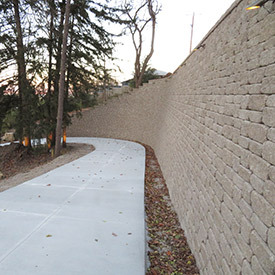 Curves and multiangle corners are possible with Mosaic, the world’s most versatile random-pattern retaining wall system.